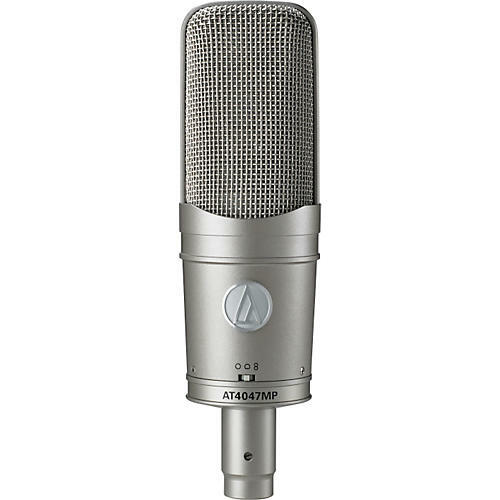 The multi-pattern Audio-Technica AT4047MP Condenser Microphone delivers vintage sound while offering selectable omnidirectional, cardioid, and figure-8 polar patterns. The AT4047MP microphone's transformer-coupled output and specially tuned element provide sonic characteristics reminiscent of early F.E.T. studio microphone designs. With a wide dynamic range, incredibly low self-noise and high SPL capability, the versatile Audio Technica AT4047MP microphone excels on vocals, strings, acoustic guitar, instrument ensembles, small vocal groups, and voiceovers.